Source: Thames Diamond Jubilee Souvenir 1867 - 1925. 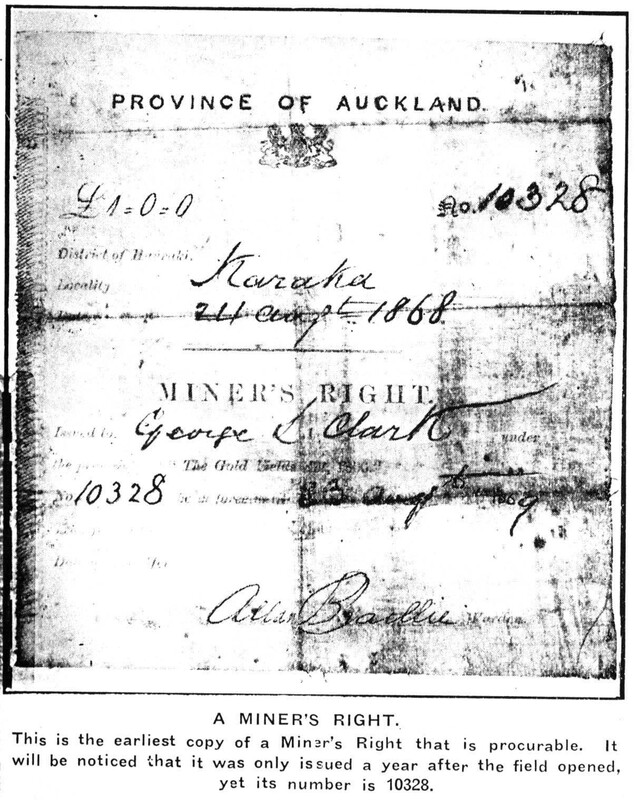 This Miner's Right #10328, issued on 24 Aug 1868 for George Clark was signed Allan Baillie. When the Thames Gold Field opened on 1st August 1867, Mr James Mackay was appointed Commissioner and Mr Allan Baillie, previously a warden at Coromandel was the Warden who issued the Miner's Rights. It cost the miners £1 to buy a Miner's Right. What did the 1868 Thames gold miner get for his £1 investment in a Miner's Right? The following are the Gold Fields Regulations as specified in "The Gold Fields Act 1866" enacted by the General Assembly of New Zealand. It was published in the Auckland Provincial Government Gazette on Thursday April 16, 1868 and came into operation immediately. (Vol XVII, No 20). Twisted in amongst the following legalese is a lot of information about what it was really like to be a gold miner in Thames in the late 1860s and early 1870s. Miner's Rights shall be issued by the Warden on payment of a fee of £1. Such Miner's Rights not transferable to any person. Every holder of a Miner's Right must exhibit the same on demand of any Officer, or any other person duly authorised in writing by the Warden. If any Miner shall be desirous of mining on any block other than that for which his Miner's Right shall have been issued, he shall within 7 days from his occupation thereof have the date of his removal thereto, endorsed on his Miner's Right by the Warden, and the same on every subsequent removal. 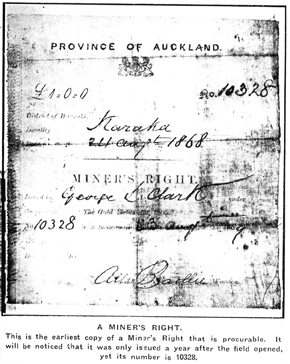 No miner shall be deemed to possess a valid title to any claim unless the same be fairly worked during the entire period of occupancy, and any claimed unworked beyond the space of one working day shall be deemed to be forfeited, unless sufficient reason such as sickness or other urgent causes, shall be proved to the satisfaction of the Warden. Provided that on the proclamation of the extension of the boundaries of any Gold Field it shall be lawful to allow a period of not more than 14 days at the discretion of the warden for the making out of claims, and the transfer or endorsement of Miner's Rights during which period no claim within the new block shall be forfeited for the non-working or non-occupancy of the same. Any miner employed in making necessary preparation for the working of any claim, or any work immediately in connection therewith, or in the erection of machinery for the same shall be deemed to be working on the claim. No miner shall take possession of any claim, race, dam, machine, or any other right or privilege whatsoever (unless the same shall have been absolutely relinquished) without first obtaining the consent of the owner or the authority of the Warden, in writing. Every claim must be distinctly marked by pegs, not less than two inches square, driven firmly into the ground, one at each corner thereof. In quartz mining claims, centre pegs shall be placed at each extremity of the claim on the supposed course of the reef, and standing at least two feet above the surface of the ground, and all to be kept clearly visible as long as the claim is occupied, provided that when any corner cannot be so marked on account of the nature of the ground, such peg be fixed at the nearest practicable point. All boundaries on forest land be well marked on the nearest trees. No person shall remove, injure, destroy, or deface any posts, pegs, logs, fence, notices, or any mining plant, of whatsoever description, without permission from the owner of the claim on which the same is situated, or deface, destroy or remove any notice posted in accordance with the Gold Fields Act or Regulations, or interfere with any mark or boundary. Alluvial claims shall mean all claims on alluvial ground. River claims shall mean claims in the beds of rivers. Creek claims shall mean claims in the beds of permanent streams which are or may be wholly diverted for the purpose of mining therein. Beach claims shall mean claims situated between high and low water mark on the sea coast. Quartz claims shall mean claims in quartz or lodes. Alluvial claims shall not exceed fifty (50) feet by fifty (50) feet for each holder of a Miner's Right. Alluvial claims may be any form provided that no block claim shall exceed in length twice the breadth thereof. The warden may grant a claim not exceeding 300 feet by 300 feet for all alluvial mining on ground which has already been worked. Applications for claims of this class shall be made in writing to the Warden, and a copy thereof shall be posted outside the Warden's office and on the ground for 14 days from the date thereof. Provided that no such extended claim shall be granted unless the Warden shall be satisfied that the ground has been previously worked. River claims shall not exceed 50 feet for each holder of a Miner's Right employed thereon, to be measured in the direction of the course of the stream, by a width not exceeding that of the bed of the stream and 20 feet of each bank. The boundaries of the bed of the stream shall be defined by the Warden or other officer duly authorised in that behalf. Creek claims shall be of the same extent and subject to the same regulations with respect to measurement; form and boundaries as river claims. If by diversion of the stream from its natural channel more ground is laid bare in the bed of the river or creek than the number of Miner's Rights held by the party shall entitle them to occupy, they shall be allowed one week from a written notice thereof by the Warden to place thereon as many holders of Miner's Rights as they shall think fit, after which time any miner may occupy the surplus ground if there remain any, paying to the party who constructed the works, a fair proportion of the expense incurred in diverting the stream. In the event of a dispute arising as to the amount to be paid it shall be lawful for the Warden in conjunction with 4 assessors (two being appointed for each party) to award such sums to be paid as seems to them, or the majority of them, to be justly due to the persons who constructed the works. Beach claims shall not exceed 50 feet by 50 feet for each holder of a Miner's Right. Such claims may be of any form provided that no block claim shall exceed in length twice the breadth thereof. Quartz claims shall not exceed 50 feet along the supposed course of the reef by 150 feet on each side from the supposed centre of the reef. The owners of any number of adjoining claims may by writing under their heads, amalgamate the same for the more economical working thereof; and immediately upon the execution of the said writing, the owners of the said amalgamated claim shall cause the same to be surveyed by the Gold Fields Surveyor, who shall connect the said claim with some fixed point, and shall deliver to the said owners a plan of the said claim...the said claims so amalgamated, may be held and worked as one claim. It shall be lawful for miners when it is not practicable to discharge the debris from their workings on to their own or on to unoccupied ground, to discharge or convey the same on to or over adjacent claims. Provided that the discharge or conveyance of such debris does not interfere with the working of such adjacent claim or claims. If the owner of any claim by improper management or otherwise, shall damage any claim adjacent by the discharge or conveyance on to or over it, of any rubbish, tailings or other debris, the person receiving such damage shall be entitled to compensation for the same, the amount of such compensation to be ascertained in the manner provided in Section 18 of these Regulations. If the owner of any claim shall have reasonable cause for suspicion that his claim is receiving damage from the working of any claim adjoining, the Warden shall grant permission for the inspection of such claim, and on proof that any damage is likely to occur, the working of such claim shall be suspended until the case shall have been decided by the Warden. No surface digging or fossicking will be allowed in any other person's claim. Everything found within the parallels of such claim shall belong to the owners thereof. Provided that if alluvial gold shall be discovered within any quartz mining claim, the Warden shall on the application in writing of any person for permission to work the same, give notice to the holder of such claim to place as many holders of Miner's Rights on the ground as there shall be alluvial claims within the block, and if he shall fail to do so within 7 days from the date of service of such notice, the warden shall then grant the ground to the applicant, subject to such restrictions as he shall deem fit to prevent injury to the interests of the holder of the quartz mining claim. Five minutes previous to the discharge of any blast of gunpowder or other explosive substance, within 50 feet from the surface of the ground, due notice of such intended discharge shall be given by the persons preparing the same, to all other persons working, residing or passing within a distance of 100 yards from the place of any such discharge. When any road or footpath passes through any such claim, a red flag not less than 1 sq foot shall be exhibited at each extremity of the intersection of the claim by such road or footpath for five minutes before the discharge. Any miner who may sink a shaft or make an excavation on his claim in search of auriferous quartz, shall substantially fence in such shaft or excavation to the height of at least 4 feet and maintain the same during the occupancy of such claim. Any miner working alluvial ground within 21 feet of any public road or crossing place shall enclose any shaft or excavation which he shall make upon such claim by an embankment or fence at least 4 feet in height so as to afford thereby a reasonable security against accidents to passengers, and no miner shall when he abandons his claim destroy or remove any such fence or embankment or portion thereof. Where, from the nature of the ground it is impossible to prevent the descent of rocks, boulders, stones, earth or heavy substances when disturbed by working, it shall not be lawful to mine on such claim, unless notice boards with the words "danger from stones," in letters not less than 4 inches in length, painted thereon, shall be placed at intervals of 10 yards along any line of road or footpath near to the place where such rock, stone or heavy substance is likely to fall. If any miner desires to change the direction of any road, he shall, for a period of 14 days, affix a notice of such his desire in a conspicuous place on such road, and shall furnish a copy of such notice to the Warden, to be posted outside his office for the same period. At the expiration thereof, the Warden shall make such order as shall appear to him to be necessary in the matter. When any two or more miners are desirous of forming a road, tramway, bridge or crossing-place, over or across any gully, creek, reef, claim or race - a notice to that effect shall be posted on the ground and outside the Warden's office for 14 days, after which period the Warden shall determine whether such road, tramway, bridge or crossing-place is necessary, and if he agrees to its formation, he shall then fix or cause to be fixed the exact line thereof. Provided that no such road, tramway, or crossing-place, shall be made over or through any mining claim unless compensation for damage or loss shall be immediately paid or tendered to the owner thereof.... Provided further that such road, bridge, or crossing-place, shall be of a breadth, where practicable, of not less than 15 feet and be so constructed that no injury shall accrue to any head-race, tail-race, drain, creek or culvert passing under it. No person shall dig within the distance of 5 feet from the nearest wheel track of any road, nor drive under the same, unless the drive shall be more than 12 feet beneath the surface of the road, nor shall any person interfere with any such road. 1. Any claim having been proved to the satisfaction of the Warden to have been worked by the party wishing to register it, for at least 3 months immediately preceding the application for Registration and no payable quartz having been obtained from such claim for at least one month previous. 2. The claim having been sunk and worked to the water - the party being unable to overcome the same - the adjoining claims being not down to the water. 3. Any claim the holder of which intends to procure machinery for quartz crushing, or water baleing, during the time of registration, and shall give security by bond, or otherwise, to the satisfaction of the Warden, that he will procure such machinery within a time to be fixed by the Warden. And such further time as the Warden shall think fit, not exceeding in the whole 12 months, according to the description of machinery and the plan for which is was ordered. 5. Any holder of Miner's Right, suffering from sickness, or being compelled to be absent from sickness in his family - Registration for the period of the continuence thereof. Proof of sickness shall be production of a medical certificate, or two of the co-partners, of holders of adjacent claims, shall make a statutory declaration before the Warden. 6. Any miner engaged as a party to or a witness in any case or as an assessor or juryman in any Court of Justice - During the sitting of the Court in the case in which he is engaged, and with reasonable time for travelling to and fro. 7. Any person engaged in actual service as a special constable, milliamp, or volunteer - during the continuence of such service. 8. Any miner wishing to retain possession of quartz or other auriferous substances, may have the same protected for a period of 3 months, provided that such substance is properly stacked on ground not supposed to be adapted to mining purposes, and that a board with the owner's name, address, and date of stacking, legibly written or painted thereon, be posted to such a stack. Any protection obtained by false representation shall be void, and not person shall be allowed to take up, occupy, or work, any quartz mining claim during the period of protection of any other claim held by him. All registered claims, shares, rights, or privileges, must be marked by a notice of the owner's name, address, and particulars of the claims, shares, right or privilege, posted on the ground. Any person discovering new gold workings, and being desirous of obtaining an increased area thereon, must immediately report such discovery, with full particulars thereof, to the Warden or other proper authority. Such persons shall then define the line of reef or lead in the following manner: - By laying bare ten feet of the same within 4 feet of the surface of the ground, if at a greater depth, then by erecting two flags in the line thereof and shall afford every facility for the inspection of such reef or lead. The Warden shall publish the particulars of every application for a prospecting claim by posting the same outside his office for 14 days. Discoverers of new gold workings may have allotted to them as reward for prospecting, where the discovery is more than 5 miles, and less than 10 miles from existing workings, and extent of ground not exceeding one additional claim per man. Where the discovery is more than 10 miles and less than 15 miles distant, two additional claims per man. Where the discovery is more than 15 miles, and less than 20 miles distant, three additional claims per man, and where the discovery is above 20 miles distant, four additional claims per man. Provided that the increased grants shall not be given to more than four persons comprising any party, and that after the expiration of 60 days from the granting of any such prospecting claim by the Warden, there shall be employed thereon one man for each man's ground held by the party. Provided also that, if the Warden shall deem fit, he may on application extend the time for fully manning the ground for any additional term not exceeding 4 months or being in whole not more than 6 months from the time of granting the additional or prospecting claims. Holders of Miner's Rights shall be entitled to occupy for purpose of residence an area of 33 feet by 66 feet. No miner shall occupy a residence site, any portion of which is within 33 feet of the centre of the road or thoroughfare, or within 12 feet of any site previously occupied, provided that in cases where two or more Miner's Rights are held by members of one family, they may amalgamate their allotments. Any miner desirous of occupying land under the preceding regulation shall mark the corners of the area which he proposes to occupy, with trenches or substantial posts, standing at least 3 feet above the surface of the ground, and shall give notice in writing in the form hereunto appended, to the Warden of the district, and a copy of such notice shall be posted and maintained in some conspicuous part of such area for the space of 14 clear days, at the expiration whereof, if no valid objection has been entered there against, the Warden may grant a residence certificate to the applicants. The holder of any residence site having any building erected thereon, may register the same for any period not exceeding 3 months during which he may be absent from the same. If any auriferous deposits shall be traced to the boundaries of any land occupied for residence, the Warden may, upon satisfactory proof thereof, authorise any surveyor or other persons by writing under his hand, to enter thereupon, and at such times, and in such manner as he may appoint to search the land so occupied, for a continuation of the said auriferous deposit. If any residence area shall be proved to be auriferous, the Warden may, upon application, order the whole or any part thereof, to be given up for mining purposes, to such persons as he shall nominate. In all cases, compensation for actual damage or loss shall be ascertained and determined in the manner provided in section 18 of these regulations and such compensation shall be paid prior to taking possession of the ground. The Warden shall make such orders relative to the mode of working the ground in any residence site, the restoration of the soil and other conditions as he may deem necessary or desirable. The right and interest in any area occupied under a residence certificate, may be transferred or assigned by the holder thereof, but such transfer or assignment shall, in all cases, be registered with the Warden and endorsed on the original certificate. Any person requiring any information from the Mining Register book, may obtain the same on payment of a fee, as per schedule annexed. Any person intending to divert and use water for mining purposes, by means of any water race to be constructed, shall give notice thereof in writing, to the Warden, and to any person whose interests may be affected by the diversion of such water, and copies of such notice shall be posted and maintained for 14 days at the source whence it is proposed to obtain water, and at the proposed termination of such water-race, and the intended course thereof shall be indicated by pegs not less than 2 inches square or by large stones placed /|\ and placed not more than 200 hundred yards apart, and such notices shall state the mean breadth and depth of the proposed water-race, and the quantity of water it is capable of carrying. And if no valid objection be entered against the construction of such water-race within 14 days from the delivery of such notice, a license renewable annually may be granted by the Warden to the applicant subject to the provisions and conditions herein contained. No license shall be granted for the use and diversion of any water which is or may be required for public purposes or for the use of the miners generally. Races constructed prior to the proclamation of any Gold Field, or of these rules and regulations, must be licensed by the Warden, as provided by section 48. Superiority of right of supply of water shall be determined by priority of occupation, the earlier occupant having the supreme right. In all cases when the occupier claims under a certificate or other authority in writing by the Warden, occupation shall be taken to have commenced at the date of such certificate or authority. The cutting and formation must be commenced within one calender month from the date of registration, and the occupier shall continue cutting and forming the same until work in completed, otherwise any superiority of right to which they may be entitled by virtue of such registration, shall be deemed void. All right to any race shall become forfeited if abandoned for the space of one calander month, unless in cases of sickness, or unavoidable absence, or in consequence of failure of water, but it shall be lawful for the Warden, in his discretion, upon sufficient cause being shown, to suspend the operation of the regulation for a further period of one month, and a certificate of such suspension shall be given in writing to the occupiers. All races that may hereafter be cut shall have a point specified at which they shall be taken from the creek or river; in races already cut, this point shall be taken to be the spot from which the race now heads. No person shall shift or alter the head of any race without the written sanction of the Warden, nor to the predjudice of any existing right. The alteration or extension of a race at any time shall not in any way effect any right or privilege attached to such race, and the holders thereof shall, during such alteration or extension, be deemed to be in occupation of all the rights and privileges attached to such a race. Provided that such alteration or extension shall first be approved of by the Warden. If the water flowing in any creek or river be insufficient to supply all the races connected therewith, the owner of any right shall, on receipt of a written notice from the owner of a superior right, stating that the supply of such superior right is less than he is entitled to, immediately cease to use the water, or such portion thereof as may be necessary to make up the supply of the superior right. (a) A stream of water gauged by a box twelve (12) feet long, ten (10) inches deep, and twenty (20) inches wide as measured in the clear, the box shall be covered throughout, the upper or entrance end of such box may be left entirely open, but the lower end of the box shall be fitted with a bar, two (2) inches high, affixed to the floor of the box, and with a pressure or headboard six (6) inches deep, affixed to the top of the box, leaving an aperture of two (2) inches in depth and of the full width of the box. (b) If more than one sluice head of water is required to be gauged, the gauge box should be enlarged horizontally to ensure accurate measurement, but when this cannot be done, owing to the natural obstacles or other sufficient reasons, the gauge box may be enlarged perpendicularly, in which case the depth of pressure or head board shall be reduced at the rate of one inch for each additional head of water that is perpendicularly measured. (c) The gauge box shall at all times be placed on a level; when water is taken from one source only, the supply shall be gauged at the head of the race at the source of supply. But if the race is fed or supplied in any part by a side stream or streams, the gauge shall be placed immediately below the side stream, or the last of such streams. (d) The velocity of the water above the box shall, if required, be lessened by construction of a dam bank, or by levelling the race for a distance of thirty (30) feet, and such velocity shall not exceed an average of one (1) foot second in the said thirty (30) feet as gauged by a float. When the supply of water from a creek or stream shall be insufficient for the use of all the holders of water right then it shall be lawful for the Warden, when adequate cause being shown, to reduce the quantity in due and equal proportion and the said holders shall be entitled toless therefrom, and to regulate the time and place in which such water may be used. Provided that nothing herein contained shall be deemed or taken to affect the right of a holder or holders of a first water right here after granted on any stream; but such such holder or holders shall at all times be entitled to a full supply of water for which he or she shall be registered. The number of sluice heads allowed on any such race as aforesaid shall be as follows - one or two miners, one (1) sluice head head for forty (40) inches of water. Four miners, two (2) sluice heads. Holders of rights shall not allow any water to run to waste, but such water shall be appropriated to the use of the next holder of a right according to the date of their respective registrations. The transfer of assignment of any race, or of any interest therein, shall not affect any right or privilege attached to such race; provided that any such transfer or assignment shall have been duly registered at the office of the Warden, and a memorandum thereof made upon the back of the original certificate. The holder or oocupier of any race, shall keep the same in repair, and shall make an efficient bridge where any road in ordinary use crosses the race, upon being required to do so by the Warden. Any person desirous of working the ground on which any race or portion of a race is situated, may do so by first providing an equally good race for the use of the occupier; provided that the consent of the Warden thereto be first obtained. No water right shall be granted for the use or diversion of any water which is or may be required for public purposes, or for the use of the miners generally. Two sluice heads of water shall, if required, be at all times allowed to flow in the natural water course of a creek or river, for general use. No person shall back the water of any creek, river, race or water course upon any claim or otherwise cause any claim to be flooded, either wilfully or by neglect. No person shall deposit any earth, stones, tailings or other substance in the bed of any water course, so as to obstruct the flow of the water therein. Where a race crosses any water course the use of which is required by holders of Miner's Rights, it shall be carried either over or under the same, so as not to interfere with the natural flow of the water therein. Before any person shall construct a tail-race, he shall first proceed by notice in the same manner as is directed in Section 48, for head races. But such notice shall only require to be posted for seven (7) clear days; at the expiration whereof the applicant shall return to the Warden a copy of the notice which shall be signed by the holders of the four (4) nearest claims, as expressing their assent to or dissent from the issue of a certificate for such tail-race. And the Warden shall enquire into any objections thereto or any cause of dissent as aforesaid, and shall thereafter issue or withhold a certificate of registration according to the equity of the case. Any person wishing to use a tail-race may do so on condition of first paying to the owner of such a tail-race a proportionate share of the expense of construction, and of any enlargement that may be rendered necessary by such use, provided that the person using any tail-race shall bear an equal share in any labor or expense incurred in clearing the the same, or such portion thereof as may be so used, whenever it shall be necessary to do so. Any person may cut a flood race through or by his claim, subject to such restrictions as the Warden may consider necessary for the public good. Upon application being made to the Warden it shall be competent for him to authorise the applicant to pass a head-race or tail-race over under or through any claim or right; provided that compensation shall be allowed for estimated damage (if any), and prior to commencing the construction of such race such compensation shall be paid to the holder or holders of the claim or right, over, under or through which the proposed race has to be constructed. Every grant or certificate for a head race shall be brought to the Warden for renewal annually, and if any such grant or certificate is not so brought within thirty (30) days after the expiration of twelve (12) months form the date at which it was granted, it may be deemed to be forfeited, and the registration thereof may be cancelled. Any miner, who may be desirous of obtaining a special site for the erection of machinery thereon shall make application in writing to the Warden, setting forth the purpose and all particulars of such machinery and stating the exact locality of the site applied for, and shall at the same time deposit the sum of five pounds sterling (£5) as security for the cost of the survey and other necessary expenses; and the Warden shall thereupon direct the Gold Fields Surveyor to make a survey and plan of such site and to report thereon. Any miner intending to form a dam or to erect a puddling machine shall give notice thereof in writing to the Warden and to the four (4) parties working or occupying claims nearest to the proposed site, who shall sign such notice expressing their assent thereto or dissent therefrom. A copy of the application or notice required by the two previous sections shall be posted for fourteen (14) days on the proposed site, and outside the Warden's office; and at the expiration of that time the Warden may, if there be no valid objection there against, issue a certificate of registration for the site applied for. Special site shall not be granted for any land known to be auriferous, unless the same has been worked out and abandoned, nor for land which is in the line or direction of any workings, or is in the center of any gully, or which is or may probably be occupied for any business purposes. The area granted to any miner or party as a special site, shall not exceed half an acrem and other sites shall not exceed a quarter of an acre. No miner shall be permitted to erect a quartz crushing or puddling machine in any locality wherein crushing or puddling operations have not heretofore been carried on, or until a main sludge channel shall have been constructed, and in all cases such main channel must be constructed by and at the expense of the person desirous of erecting such machine. The position and course of all main sludge channels, and the width and depth thereof, shall be subject to the approval of the Warden, who shall have the power to alter and vary the same whenever it shall seem to him necessary so to do; and upon his approval of any such main channel, the Warden shall grant a certificate of the same to the applicant. The expenses of the construction of such channel shall be borne by the persons then or afterwards using the same, in proportion to the position of each machine relatively to the said channel, and payment of such proportion to the person constructing the same shall be made prior to the granting of any certificate of registration. Main sludge channels shall be kept clear and in good repair by the joint labour of the machine holders in each locality, and the owner of each machine shall further keep clear and in good order, the private sludge drains connected with such machine; and on no pretence whatsoever shall the sludge from any main channel or private claim be permitted to overflow the edges thereof. When sludge or water drains run across or under any road in general use, a substantial bridge (the culvert of which shall be of sufficient size to carry off the sludge or water) shall be constructed and kept in repair by the owner of the machine whence such water or sludge proceeds. The site of any dam or machine not commenced within fourteen (14) days from the date of the grant thereof, or not completed within a reasonable time, or any dam or puddling machine unoccupied for one month during a period when sufficient water has been available, shall be deemed to be forfeited and may be granted by the Warden to any person who may apply for the same. If any claim shall be flooded or property injured by the bursting of any dam bank, the owner of such dam shall be liable for any loss or damage occasioned thereby, provided that it is proved to the satisfaction of the Warden, that such breaking away resulted from the faulty construction of such dam. If it shall be proved that the ground occupied by a dam or machine contains auriferous earth or quartz, the party desiring to work such ground, must make application in writing to the Warden, for permission to enter on the same; and if the Warden shall deem fit, the owner of such dam or machine may be compelled to leave or remove the same; provided that adequate compensation for such leaving or removing shall first have been ascertained and determined in the manner provided in Section 18 of these regulations, and shall have been paid by the persons desirous of working the ground. Business licenses will be issued authorizing the holder thereof to carry on business within the proclaimed Gold Fields. Each holder of a business license shall be entitled (except in reserved townships) to occupy for business purposes an area not exceeding forty (40) feet by one hundred and twenty (120) feet for each license held by him.Licenses may be transferred from any site to another site, provided that no person shall carr on business in more than one place under one license. Occupants of sites for business purposes shall place and maintain at each frontage corner of such site, a peg not less than three (3) inches square, and standing at least one foot above the surface of the ground. An open space of six (6) feet shall at all times be left between buildings occupied for business purposes (except in reserved townships). The holder or occupier of a single business area or site shall only build upon thirty four (34) feet of his frontage. The holder or occupier of two or more adjoining areas or sites may build upon forty (40) feet frontage for every additional area or site. Business sites may be registered with the Warden for ten (10) days whilst the holder is engaged in preparing for the occupancy thereof, such registration may be renewed by the Warden for an additional period of ten (10) days, and such renewal shall be endorsed on the certificate and recorded in the registration book. Business sites can only be held or occupied by holders of Business Licenses, and no site can be held unoccupied for more than twenty four (24) hours, unless the the same shall be registered as in Section 90. When any business site has been registered, the holder shall post and maintain thereon a board, not less than nine (9) inches square, with the word 'Registered' and the date and number of such registration legibly painted or written thereon. A space of sixty-six (66) feet shall at all times be left for a road or a street being between business sites; and no person shall, on any pretence whatever, encroach upon such roadway. The Warden may, whenever it shall be necessary for the public convenience, set apart land to be occupied for business purposes, and direct the Mining surveyor to divide such land by streets and roadways in the most convenient manner, and no person shall occupy any part of any land so set apart, except under a business license. Where any township site shall have been reserved by or for native owners thereof, any person occupying land in any such township must, if carrying on business thereon, be the holder of a business license. And no person shall occupy any portion of any such township except by permission of the Warden, or unless he pays rent for the same. Any holder of a Miner's Right will be allowed to use timber (other than kauri) for building or mining purposes or for firewood, provided that such firewood is procured within the limits of the block of native land upon which he is lawfully mining for the time being. Any person requiring kauri timber must apply to the Wardenm who will give permission to cut the same on payment to him of the sum of one pound five shillings sterling (£1 5s) for each tree required by the applicant. If any person shall willfully or negligently set fire to any forest, timber, scrub, or fern whereby kauri timber shall be killed or destroyed he shall pay fair compensation to the native owners thereof, which shall be ascertained and determined in the manner provided by Section 18 of these regulations. Any person desiring to cut timber for firewood or fencing for sale shall make application to the Warden for a license, and shall state the locality which he desires to cut timber within; and a copy of such application shall be posted for fourteen (14) days in at least two (2) conspicuous places on the ground and outside the Warden's office. If no valid objection is made, the Warden may grant a timber license on payment of a fee of five pounds sterling (£5) which shall be in force for twelve (12) months from the date thereof, and shall entitle the holder to cut timber (except kauri or reserved trees) within the block of native land for which the license is issued; provided that every person holding any such license, and every person employed by him to cut timber, she be a holder of a Miner's Right issued or endorsed for the block of native lands within which such timber license shall be in force. If any person shall fell a tree or timber either intentionally or by undermining or other means, he shall remove it beyond the reach of floods so that it may not be drifted down into any stream. If any person shall fell any timber on to any adjoining claim or on to a public or private road so as to cause an obstruction he shall immediately remove the same. No person will be allowed to depasture any cattle within the proclaimed gold field, unless he be the holder of a Miner's Right or carter's license, and shall pay a registration fee, as per schedule annexed, for each head of cattle depastured by him within the said gold field. For the purpose of this and the following regulations the word cattle shall be deemed and taken to mean and include horses, mares, colts, fillies, asses, mules, bulls, cows, steers, calves, rams, ewes, sheep, lambs and goats, and shall be deemed and taken to mean and include and apply to any one animal of the said several kinds. Provided that no person shall be allowed to run swine at large within the gold field. No person shall permit or allow any cattle owned by him to trespass on native land reserved for residence, cultivation, or burial ground, and in addition to any penalty which may be enforced for such breach of this regulation, compensation for actual damage sustained shall be ascertained and determined in the manner provided by section 18 of these regulations. Persons not to trespass or damage native reserve. No person shall mine for gold, occupy timber or scrub, or set fire to any scrub, fern, flax, grass or rushes on any land reserved for cultivation, residence or burial ground, the locality of which has been defined by lines cut or notices posted on the ground. No person shall camp on any road or within the limits of any township, unless he first receive permission from the Warden so to do. And when any reserve shall be formed as a place of temporary residence for miners, within or near to any township, the Warden shall give such directions as shall from time to time appear necessary for the preservation of order and prevention of nuisances within such camp reserve. No person shall be permitted to erect permanent buildings, or carry on business within the boundaries of such reserves. No person shall, within the limits of the proclaimed gold field, ply for hire any cart, carriage, or other wheeled vehicle, drawn by horse, horses, ox or oxen, unless he be the holder of a license, duly empowering him in that behalf. Such licenses shall be issued by the Warden, on payment of a fee of one (£1) pound for each cart, car or other such wheeled vehicle, owned or used by the applicant. Every person holding such license shall paint on some conspicuous place on the right side of each cart, car, or other wheeled vehicle so licensed, his name and the words licensed carter, in letters not less than one and a half (1 1/2) inches in length with a proportionate breadth. The regulation of all other operations and proceedings connected with the proper working of the Gold Field, shall be left to the discretion and judgement of the Warden until otherwise provided for. Every person committing any breach whether by omission or commission of any of the above rules and regulations will be liable to the penalties set forth in 'The Gold fields Act 1866' viz: -For the first offence, a fine of any sum not exceeding £10 and for the second or any subsequent offence, not exceeding £20. N.B.-Persons mining on native lands not included in the boundaries of the Gold Fields, but adjoining thereto, shall be liable to the penalties set forth in clause no 98 of the Act. Although these regulations were in force in Thames after 1868, they were based on the experience gained in Otago and the rest of the South Island where a similar system was in force from 1861 onwards.